Have you secured your 2015 vacation yet? With the release of Disney’s 2015 packages last week, there have been a lot of system glitches. With quotes rolling out, and people getting booked, this leads me to ask, have you secured your 2015 vacation yet? We are booking 2015 packages now. Remember, with Disney packages you can book it now for a $200 deposit per room and take time to pay it off. Kind of like a “Vacay Lay-A-Way”. As long as you get your vacation paid in full by 45 days before check in, you can pay as little or as much as you can each month. Can’t pay in October? No biggie. Catch up in November! December a little tight because of Christmas? No worries, hit it in January! Disney’s payment system is easy breezy! Since you are loyal Orlando Fun and Food readers, I am offering you all a great perk. All of my Orlando Fun and Food readers who book with me by December 31st 2014 will receive a FREE Mickey Bar AND a FREE phone call from Mickey before your trip! Pretty cool right? Well, keep reading because I have another great offer for you! 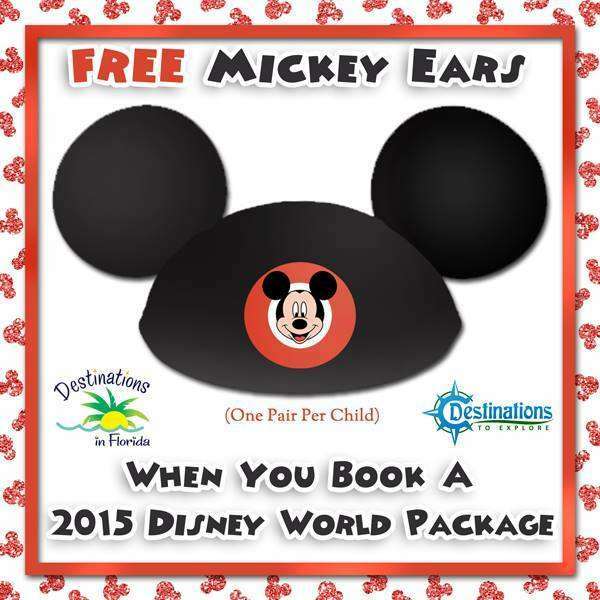 Along with the Mickey Bar and Phone call, when you book your 2015 package with me before August 31st 2014, ALL of the children in your travel party will receive a FREE pair of Mickey Ears as a Thank you from me!